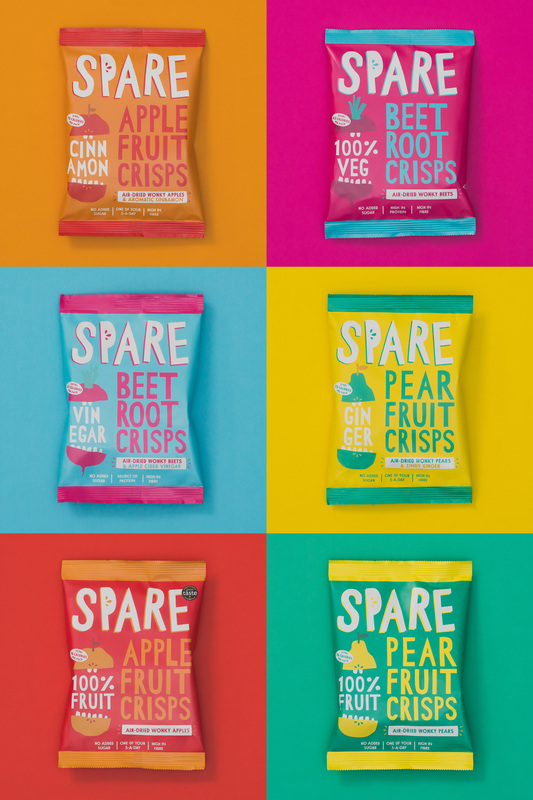 Established in 2016 (originally as Spare Fruit), Spare Snacks is a snack brand in the UK that turns unwanted fruits and vegetables into air-dried chips (“crisps” for our readers on the other side of the ocean). 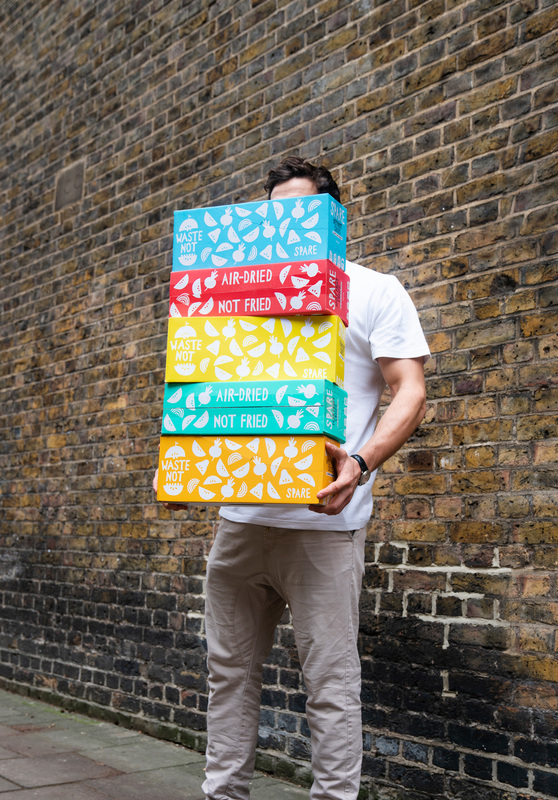 The founder, Ben Whitehead, started the product by experimentng with dehydrating produce and initially launched with apples and pears selling in select retailers. 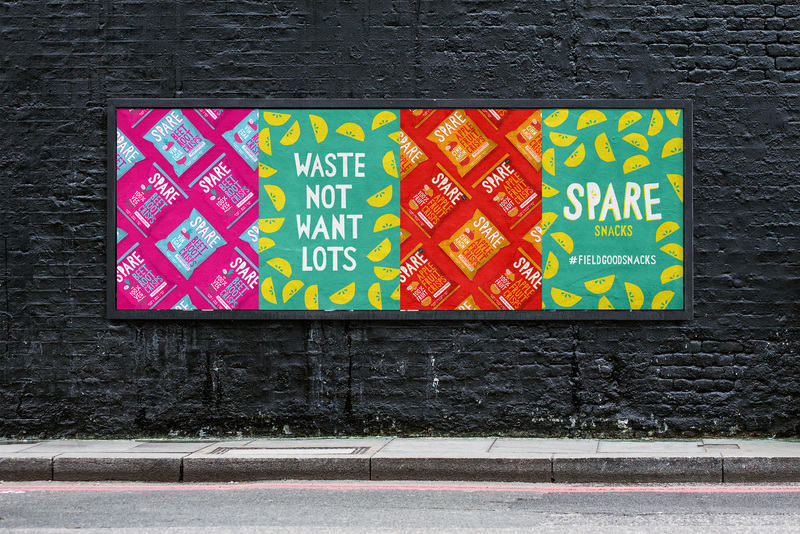 As part of their process, they support small British farms by purchasing their fresh produce deemed the wrong shape, size, or color and aim to raise awareness of food waste. 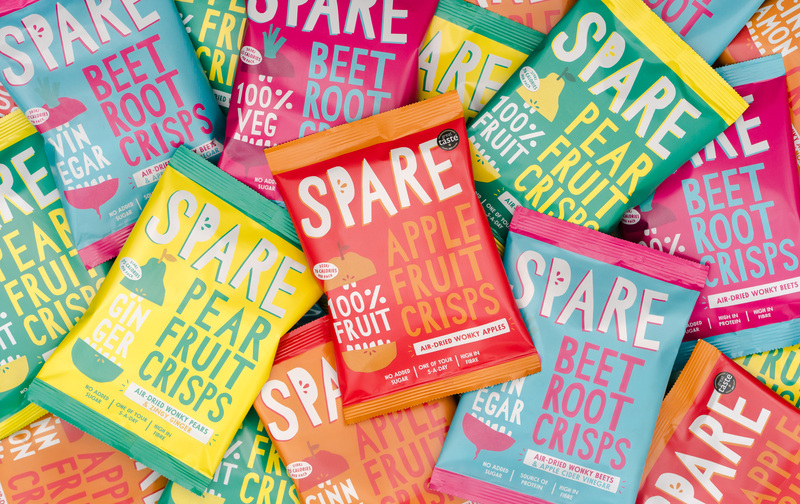 In preparation to expand its reach across the UK, Spare Snacks recently introduced a new logo and packaging designed by London, UK-based The Clerkenwell Brothers. Our process began with a sheet of paper and a pair of scissors. 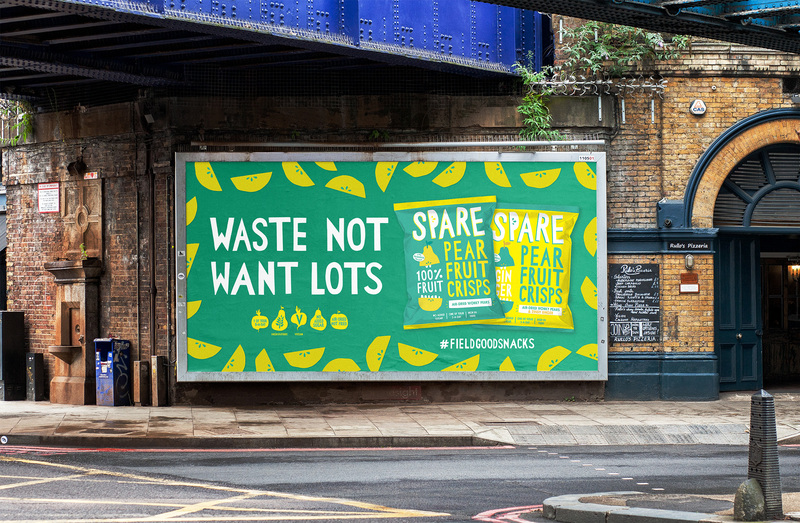 Our experiments resulted in a charming set of irregular fruit and veg shapes and unique ‘wonky cut’ lettering. 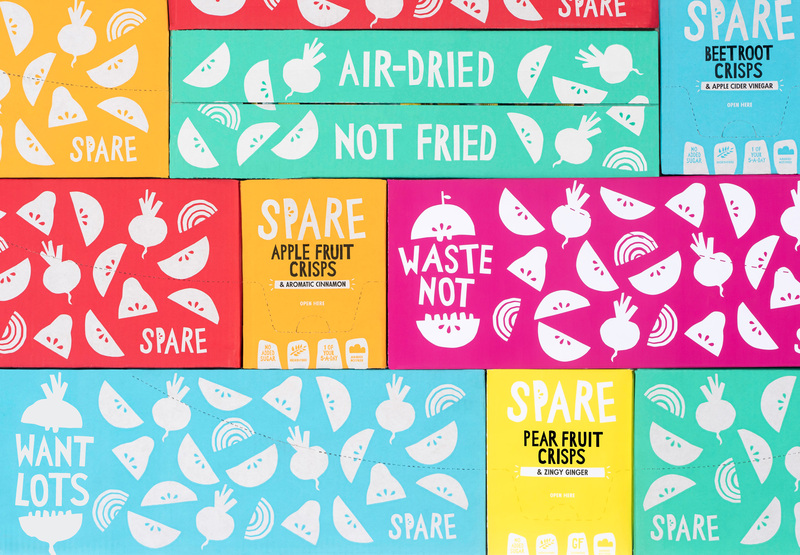 Our fruit and veg slices evolved into six quirky characters which feature as flavour cues on-pack and can also be used as text holders across the off-pack world. These characters organically transitioned into animation, with the movement boldly communicating the product’s satisfyingly crunchy texture. The full range includes three pure fruit/veg packs and three punchy, flavoured counterparts. We carefully devised a six-colour palette which would allow all packs to sit together while the pure and flavoured packs could be recognised as three separate pairs, yet still communicating the ingredients and flavours of the product. The old logo had the right idea of wonky-fying the letterforms to mimic the wonkiness of the produce they were using. It was also a well done logo but in its choice of font, color, and wide spacing it came across more as a science-based snack than a nature-based one. In the context of the old packaging, as you’ll see below, it’s less so thanks to the watercolor illustration but being so prominent on the bag it almost looked like something astronauts would take into space to snack on. The new logo more instantly conveys the premise of the product with a rawer, more organic approach that is also way more fun. I was going to say “I’m not saying that all organic snacks need to look raw and organic and hand-drawn to convey that aspect” but I do think that that’s exactly what I’m saying. Or, at least, it helps a ton adopt this aesthetic to communicate clearly and quickly on the shelf. A couple of quibbles in execution: the two “S”s in snacks are the same when they should be different and the main color combination for the logo makes the seeds in the “P” look more like a lemon/lime than a pear or apple. Still, fun. The old packaging, like the logo, was fairly nice but I feel like, aside from space-y, it came across as a gourmet, high-end product which maybe was the intent originally. The new approach feels more authentic and true while demanding more attention (in a good way). 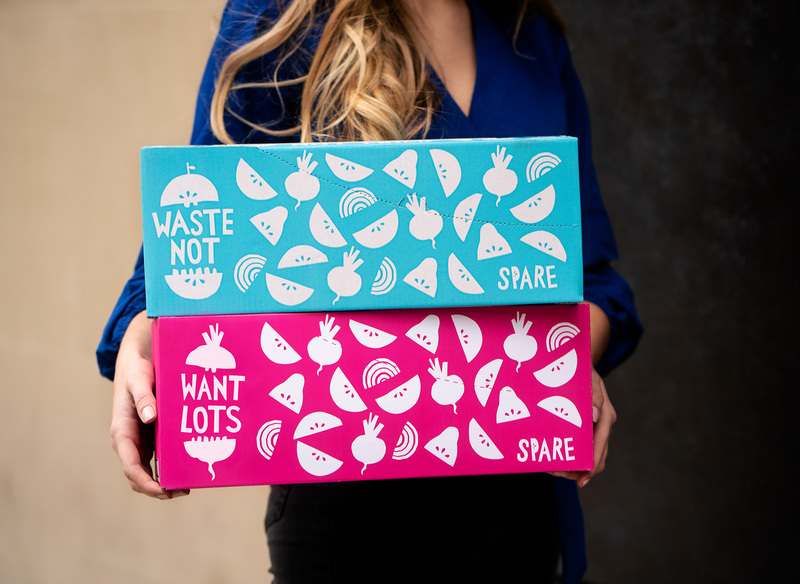 The new bags feature more prominently the type of produce it contains with big, custom typography and comical illustrations of the produce with teeth. The color combinations are striking and appropriate for the whole “Hell-yeah!” vibe the brand has going on. The boxes look great with the big swaths of color and the illustrations knocked out — they have a kind of Mid-century Modern meets Grunge aesthetic that’s fairly entertaining to look at. In the ads below, I like how they present the bags in the alternating compositions that show the slight variations on the same flavor while creating a cool-looking pattern. I also dig the tagline. Overall, this is a great evolution. Personally, I know that, if I were in a store, I would overlook the old packaging but this one would definitely make me look and consider buying it instead of Funyuns.